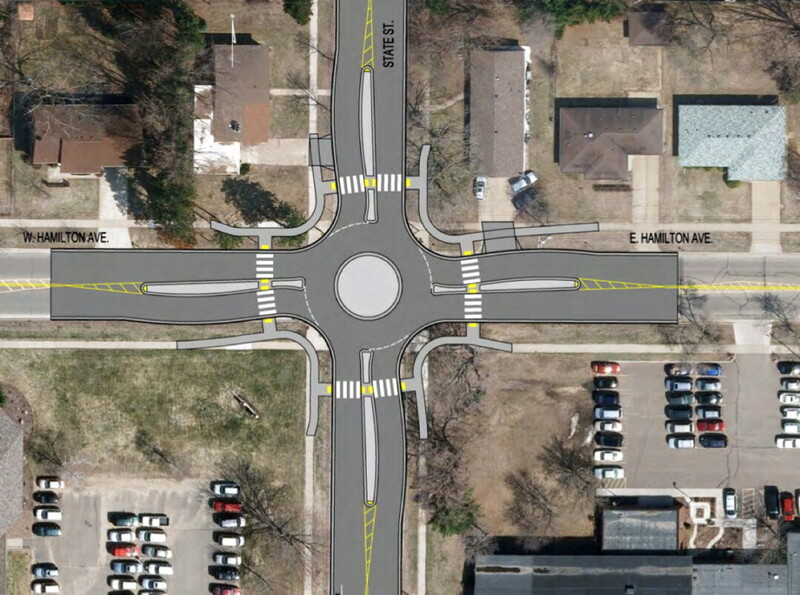 The roundabout planned for the intersection of State Street and Hamilton Avenue in Putnam Heights. Construction on three roundabouts on a one-mile stretch of State Street in Eau Claire will begin in June, with a fourth slated for 2020. The first three will be built at the intersections of State and Hamilton Avenue, MacArthur Avenue, and Lexington Boulevard over the course of the summer and fall, with an expected completion date sometime in December. The fourth project, at the intersection State and Roosevelt, will require the city to purchase land from the residents of four corner lots before construction can begin. The City Engineering Department’s recommended plan did not include the Roosevelt roundabout in part because of the necessary acquisition of real estate. At the March 12 City Council meeting, the council approved an amendment proposed by council member Jeremy Gragert to explore the addition of the Roosevelt traffic circle and pursue the necessary acquisition. The project, as it was approved, would put the outer edge of the sidewalk about 14 feet from the closest home. Though the catalyst for the roughly $2.5 million project was the need to replace aging utilities under the street, through a process of community engagement over the course of 20 open houses the plan quickly grew to incorporate public concerns about traffic flow and vehicle, bicycle, and pedestrian safety. “What roundabouts do is they reduce the number of conflict points in an intersection,” David Solberg, the city engineer, explained. At a standard intersection, there are 32 points of conflict at which a collision between vehicles can occur. A roundabout reduces that number to eight while simultaneously slowing oncoming traffic, resulting in fewer serious accidents. Some people speculate that the unfamiliarity of traffic circles also encourages increased caution on the part of drivers. Slowing traffic and eliminating the full stop makes the route more easily traversed by cyclists. The engineering department also found that replacing the intersections with roundabouts would reduce congestion during busy hours, especially at the Hamilton intersection. “We do acknowledge that there are some people who weighed in who don’t like roundabouts,” Solberg said. “It’s not something we took lightly, but from an engineering perspective, the corridor will be a dramatic improvement.” Before working for the City of Eau Claire, Solberg was involved in the implementation of one of the state’s first traffic circles. While the project faced criticism, after people began using the roundabout, their concerns were largely assuaged, he said. The project will also replace one lane of traffic on the State Street hill with a bike lane, improve sidewalks and driveway approaches, add decorative lighting, and incorporate some landscaping elements. Construction will stretch from the UW-Eau Claire campus to city limits along State Street. A detour will direct motorists to the Harding Avenue hill to navigate between downtown and the south side.